thick the fillets are. Allow to cool in the poaching liquid before removing from the saucepan. Spoon the cream cheese over the pasta, then add the sour cream and the lemon zest and juice. Toss well to coat. Divide the pasta among four plates. 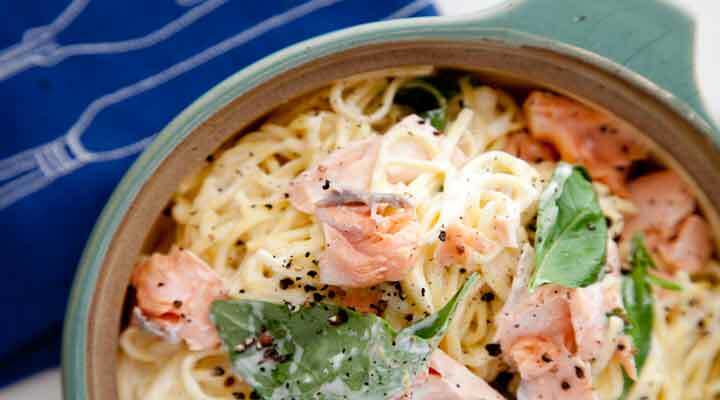 Top with some poached salmon and garnish with a sprig of fresh basil. Season with a little black pepper and serve immediately.